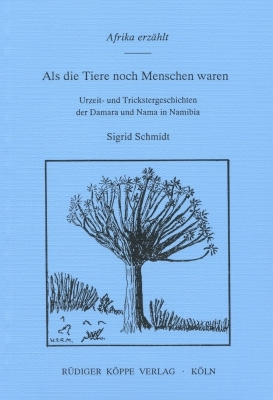 This collection has been dedicated to the probably strangest but also most fascinating African trickster, Heitsi Eibib, or Haiseb of the Nama and Damara people in Namibia. The author has successfully included many still unknown stories about him and about prehistoric times when animals were still human beings. In 52 texts a character emerges before us who at the same time takes after a god and a fool. We see the sun, the moon, and the stars rise up from his body, but also how he is being beaten up by strong women who have been annoyed by him. We are amazed about his opponents, strange creatures like the flying lions or the woman who shuts her house by breaking wind, and we laugh heartily at his roguish pranks. At the same time this volume shows what has become of these prehistoric tales that have almost totally disappeared nowadays and underneath which masks we have to look for some of their remains. For instance we find relics of these tales even as anecdotes in speeches of today’s political gatherings. The second part gives information on the narrators and the circulation of the tales, and the third part deals with that prehistoric time and the rogue Heitsi Eibib in more detail. It also shows the relationship with old customs, religious beliefs and symbols and contrasts this trickster with tricksters of neighbouring peoples and peoples from other areas in Africa. Sabine Wienker-Piepho in Märchenspiegel, 7/1, 1996, pp. 28f.